In the foothills of Mexico's famous Sierra Madre lies the industrial, iron-rich city of Durango, the capital city of the Mexican state also known as Durango. It is here that the story of Los Dug Dug's began in the early sixties with a local high-school band called Xippos Rock. And it is in this band that two young, musically-inclined teenagers named Armando Nava and Jorge de la Torre began a long and productive musical partnership. In 1966, after working hard at perfecting their sound, Xippos Rock decided to pursue their dream of a rock & roll life on the road. With Armando's father, a salesman, leading the way (and doing his business as they went), they traveled from Durango to Tijuana in a two-week period. Midway through the trip, Armando decided to change the name of the band to Los Dug Dug's, an abbreviation he had come up with of the band's native city and state. The newly-renamed band finally arrived in Tijuana and began its climb to the top. After paying some dues playing behind go-go girls at Fantasitas, a strip bar, they landed a regular gig in the more music-oriented Mike's Bar, and their reputation started to grow very rapidly. They also landed a few gigs across the border, where they picked up on all the latest sounds not only from America, but Liverpool as well. Bringing the Beatles' records back with them, Los Dug Dug's became not only the first band to play their songs in Mexico, but also the first in Mexico to sing theirs and other bands' songs in English, breaking what had been a rule in Mexican rock up till then. With their popularity in Tijuana growing day by day, Armando decided to bring the band to Mexico City in 1966. Along the way, two of the band's members quit and were quickly replaced. The gamble proved a successful one as the band quickly built a following in the Districto Federal and attracted the attention of RCA who signed the band to a long-term contract. Their first single was "Chicotito Si, Chicotito No," a Mexican children's TV show theme song! 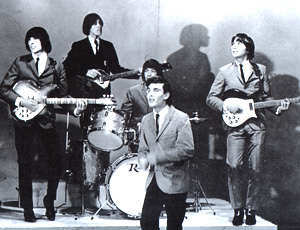 The band also appeared in two movies in 1967: El Mundo Loco De Los Jovenes (The Crazy World of the Teenagers), which featured members of the band standing in as the house band in the club scenes, miming to music played by session cats, and Angel O Demonio a/k/a Cinco De Chocolate Y Una De Fresa (Angel or Devil -- Five of Chocolate & One of Strawberry), for which they wrote, and performed live, the instrumental "Tema de Los Dug's," which was released as a single. 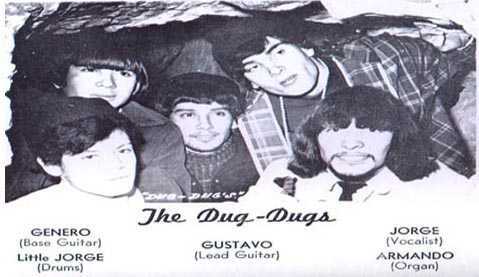 In 1968 Los Dug Dug's took their success back to Tijuana and found themselves playing to even bigger audiences than before. It was at a club called Sans Sous Ci that an American tourist named Frank Mangano saw them, was blown away, and offered them the opportunity to try to crack the American market, a virtually unheard-of opportunity for a band from Mexico. Late that year the band flew to New York and began a valiant but ill-fated attempt to get a groove going there. Live recordings exist from this period of their history that feature the band, with Jorge de la Torre on vocals and remarkably good English pronunciation, Gustavo Garayzar on sizzling lead guitar, and Armando on keyboards, tearing through raunchy, garagey versions of everything from "Gimme Some Lovin'" to "Summer in the City" to Sam Cooke's "Shake." The band also made a few unreleased studio recordings including early versions of "World of Love" and "Eclipse," which would later become hits in Mexico as well as key tracks on their first album. But try as they might, they just weren't getting the kind of attention they got in Tijuana or the D.F., and with the music unions knocking on their door demanding their money, Los Dug Dug's returned to Mexico, disillusioned but refusing to give up. By 1971 they had released their first album on RCA Mexico, sung entirely in English, and had accepted an invitation to play at the notorious Avandaro festival, a.k.a. "The Mexican Woodstock," a rock festival held under threat of massive government oppression on September 11, 1971, for a number of Mexican rock & rollers estimated anywhere between 250 and 300,000. But the band that began the event that day was already in turmoil: creative tensions had taken their toll on the long-held musical partnership between Armando Nava and Jorge de la Torre as Armando became more and more of a dominant force in the band. Jorge left just after the recording of the band's first album and before the show, forcing the band to perform as a quartet. Eventually this lineup of the band would break up, and Armando would take the name and reinvent the band in 1972 as a power trio. 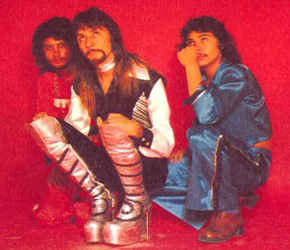 By this time, in Mexico, Los Dug Dug's were no longer the only Mexican rock band singing in English, but one of dozens. Bands such as El Ritual, La Revolucion de Emiliano Zapata, and Three Souls in My Mind had cut albums in English, and the pressure was on for Los Dug Dug's to do the same for the second album in a row. But Armando was finding less and less sense in this idea; this was Mexico, after all, not America! After recording English versions of "Smog," "Yo No Se" (I Don't Care), and "�Cual Es Tu Nombre?" (What's Your Name? ), Armando finally collapsed under the pressure, fled the recording sessions, and locked himself in his house, refusing to leave for two full weeks. By the time he emerged from his seclusion, he had a new set of songs and a determination to do the band's second album in Spanish. Many of the songs would be strung together to form one of the most ferocious moments in Mexican rock & roll history, the incredible 12-minute "Hag�moslo Ahora" (Let's Make It Now). Additionally, Armando was sporting a salt-and-pepper look that he would display on the cover of the album, SMOG, released in late 1972. The album would prove influential in at least one respect: many Mexican bands went back to singing in Spanish shortly thereafter. The era of English-language rock in Mexico was over, and the scene had been forced underground in the aftermath of the Avandaro festival. 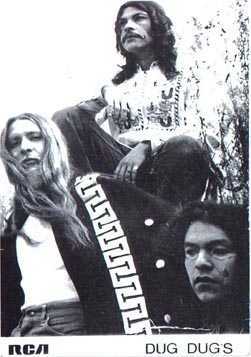 Though SMOG gave the band another hit single in the rather topical title track, the overall heaviness of much of the rest of the album (especially "Hag�moslo Ahora") ensured only modest success for the band. When it came time to record their third album, CAMBIA CAMBIA (Changes, Changes), in 1974, the band adopted a more clean-cut look, had photos taken of themselves lounging in the Mexican countryside, and streamlined their sound into a more cleanly-produced pop-rock groove. It was yet another fine album, though no doubt it put off some of the fans who were wondering how they could possibly follow an album as brutal as SMOG. The new sound and album earned the band some of the wider radio exposure they desired, in places like Guadalajara, Tijuana, and La Paz, but strangely enough, the album somehow went unnoticed by the major stations in Mexico City, where they needed the airplay the most. Worse, the band was receiving very little promotional support from RCA, forcing them to tour extensively on their own budget in a small, cramped van which sometimes served as their sleeping quarters after a gig. 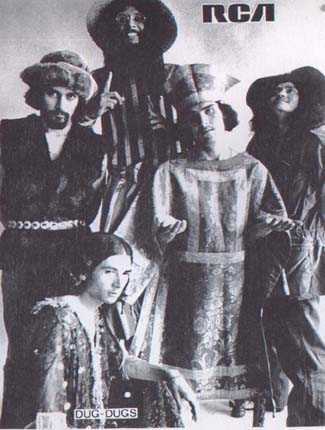 EL LOCO (The Crazy One), the band's final album for RCA, saw them returning some of the harder edge to the pop sound cultivated on CAMBIA CAMBIA, in songs like "Stupid People" and "We Always Hate Your Manners." Also around this time, RCA tried Armando out as an in-house producer. He produced and arranged a lovely album for Pajaro Alberto Y Conjunto Sacrosaurio, Viaje Fantastico (Fantastic Voyage), and a rather commercial sounding pop album by Five Fingers, including a Spanish language cover of the Four Seasons' "December 1963 (Oh What A Night)." But with RCA's support of the band dwindling further with each album, it was inevitable that the band would eventually cease to record for the label, and EL LOCO would be the final Dug Dug's release for several years. From there, Los Dug Dug's went the way of many other classic Mexican rock groups, making a modest living playing dozens of gigs every year all over Mexico and particularly in the D.F. In 1981, Armando transformed his love of the Beatles into a huge symphonic rock tribute to the Fab Four, which he arranged. 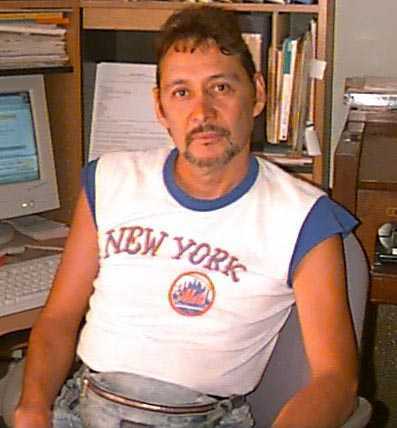 Then, in 1985, came the event that triggered a long and bitter batle between Armando and RCA: without his permission, the label compiled and released the album 15 EXITOS DE LOS DUG DUG'S (15 Hits of the Dug Dug's). Although the album features the interesting inclusion of the original versions of "Stupid People" and "Joy to People" first released on a free single included with the original pressing of the first album, it was an unauthorized release and Armando went to the company to complain. He eventually offered to put up his own money to have Ariola press up ABRE TU MENTE (Open Your Mind), an odds & ends album he had compiled, partially as a way of countering the greatest-hits album, and partially as a way of paying tribute to former Dug Dug Jorge Torres Aguayo, who had died of congestive heart failure a few years earlier. When the RCA label was bought out by BMG, Armando secured the origial masters of all the band's recordings, figuring this would give him more control over possible future reisssues of the original albums. But the label, using second- generation masters, gave in to the La Ciruela Electrica label, which beat Armando to the punch and distributed its own, BMG manufactured CD reissues of them. After much legal litigation, Armando finally succeeded in working alongside BMG in carefully remastering all of the original albums, along with ABRE TU MENTE, and these are now being made available with Armando's own distribution. Today, Los Dug Dug's continue to exist in one form or another, always with Armando Nava at the helm & sometimes also featuring younger brother Enrique on drums. Along with his manager-mother Elena, Armando runs the Mexico City rock club La Reunion, at which Los Dug Dug's regularly play and rehearse at. Recordings have been qute infrequent lately, but a few years ago the band contributed to the compilation CD ROCKIN' TONIGHT, performing their own interpretations of songs by James Brown, the Troggs, Steppenwolf, and Wilson Pickett. They also appear quite frequently on Mexican TV, and were the star attraction at 1998's Avandaro 2 concert at Mexico City's famed Teatro Metropolitano. Now, as then , Armando Nava remains totally committed to his music. All of us can only hope he never gives up.